The soil lines under doorways and along walls in your home are called carpet filtration lines. The lines are also known as filtration soiling or draught lines. These lines are a very common issue in a lot of homes in Fort Wayne. What causes carpet filtration lines? The reason for carpet filtration lines are pollutants in the air of a home. During the winter and cold months in Fort Wayne, homeowners turn on their furnace and turn up the heat. Then the warm air rises and collects all of the toxins, allergens, pollutants, dirt and particles in the air. Eventually warm air settles, or drops, in order to move to cooler spaces. This means all of the particles in the air settle down onto the carpet. Then the air tries to push its way under the doorways or cracks in the wall and baseboards. The air pushes through and then leaves all the particles, dirt and dust embedded in the carpet beneath and around the door. The problem is then compounded because entryways to rooms receive a lot of foot traffic every day. This means homeowners and their family members walk on the embedded dirt over and over and push it further into the carpet fibers and wear down those carpet fibers. If carpet becomes too worn it becomes much more difficult to clean and remove dirt and stains. Carpet filtration lines are very difficult to remove due to their location and the fact that the carpet is worn down. You should not try do-it-yourself carpet cleaning for carpet filtration soiling and instead hire Fort Wayne carpet cleaners in Allen County, IN. Chem-Dry of Fort Wayne uses the proper equipment and solutions to reduce and often remove carpet filtration lines from your home. The Natural®, our cleaning agent, lifts oils and dirt from the entryways to the surface and then we extract it from the carpet with Hot Carbonating Extraction (HCE). 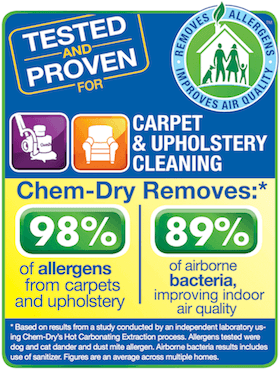 Your best chance at removing carpet filtration soiling is an appointment with Chem-Dry of Fort Wayne. Call (260) 409-1138 to schedule an appointment.